There’s a tendency to think of Fiat as a manufacturer of bread-and-butter vehicles in the family and commercial markets, but looking back over the years, it showed a sure touch in producing classic sports cars and coupes, in most cases derived from family saloons, but in every case rewarding owners with a very pleasurable driving experience. This month we review a short selection of Fiat’s classic coupes, ranging from the 1960s into the 1990s. First up is the 850 coupe, based on the 850 saloon and introduced in March 1965. The body styling was done in house by Fiat, with the Boano father and son team the creative brains behind the design. It was a 2+2 coupe, and featured a tuned version of the 850 engine, giving around 35kW (47bhp), which was enough for lively performance as the car was light, and geared well to make the most of the power. The top speed was just short of 145kph (90mph), though the little engine was revving pretty fast at that speed, and the car handled well with eager turn-in and a slight tendency to oversteer. It sold like hot cakes, as indeed did its stablemate the Bertone-styled 850 Spider, which had a slightly more powerful engine. It was available in New Zealand from 1965 to 1968, imported in cbu form, and competitively priced at $2200 to 2700. In March 1968, the coupe was updated with the introduction of a 903cc version. Power went up to 39kW (52bhp) and the styling was changed very slightly to incorporate a neat little spoiler at the rear, probably too small to do anything useful to the airflow but quite visually distinctive. Two extra headlamps were built into the front, partially sunk into the front panel. This model was assembled in New Zealand from 1969 to 1972, and sold rather well, priced at around the $2900-3000 mark. The extra power lifted top speed by about eight to 13kph and improved acceleration, and the car was also a little more economical. It was now called the 850 Sport Coupe. The coupe and spider between them sold around 467,000 units, with the coupe scoring 342,873 of those sales, pretty good for only six years production from 1965 to 1971, while the spider remained in production till 1973. 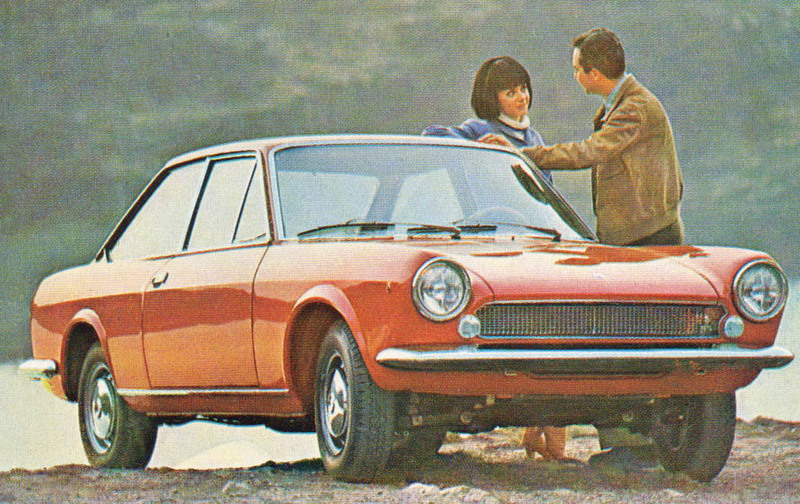 On to the late ’60s with the 124 Sport Coupe, introduced in March 1967. It caused a minor sensation on introduction with its clean and elegant styling — again done in house by Fiat’s own body styling team — and crisp performance from the 1438cc twin-cam engine. Road tests revealed that the coupe handled very well on the road and had very nearly full four-seater accommodation, plus a decent boot. It was not a light car, so acceleration and top speed figures were down compared to the Alfa Romeo opposition, but they were quite competitive with the MGB GT. Late in 1969, the coupe was updated with styling changes and now used the 1608cc engine from the 125 saloon, though the 1438cc motor was available as an option. Performance was improved at no cost to economy, but opinions were divided about the styling changes, as the new full width grille and twin headlamp set-up lost some of the simplicity of the first design, though it was still a neat and tidy one. A little of the handling finesse was lost as well, with slightly softer suspension settings and a change in rear axle location contributing to this. Late in 1972, the engine was changed again, this time to the 1756cc motor from the 132 saloon, though as before a smaller engine option was available, this time the 1592cc version of the 132 engine. Power was up again, to 88kW (118bhp), but with increased weight, performance and economy were little changed, though the handling got better again. The facelift styling changes to the front of the car were to most onlookers a retrograde step. Production ceased in late 1975, by which time nearly 280,000 had been built, and Fiat shifted its sales strategy to promoting the sister 124 Spider. All the models were imported cbu into New Zealand from 1967 to 1975, with the earlier series cars available in more limited numbers. With the mainstream Fiat brand seeming to turn its attention in the ’70s and ’80s to daily transport vehicles, coupes figured rather less in the company’s plans, but it maintained a presence in the coupe market through both the front-wheel drive 128 coupe and its derivative the 128 3P, which continued to sell well through the ’70s, and the mid-engined X1/9, introduced in 1972. The 128 coupe was a nice little car, but is very rare over here, so for this article we’ll concentrate on the X1/9, which with its removable roof served quite well as a two-seater coupe, though it was really a replacement for the 850 Spider. It sold well from late 1972 right through to 1989, initially with the 1290cc motor and from late 1978 with a 1500cc 63kW (85bhp) engine and five-speed gearbox from the Strada series. From 1982, Bertone took over the building duties on the car. Rare in NZ, the earlier models with the 1300 engine have less sparkle to their performance than the later 1500s, but many owners like them better than the later cars. The 1500s with the five-speed gearbox came in from late 1978, with a $16,500 price tag, and the price rose through the ’80s up to $45k, and then back down into the thirties for the final few years, sold as Bertones. Last imports were brought in in early 1990. This is one of those cars where ‘fun to drive’ outweighs high performance as the reason for purchase. They were heavy cars for the 56 or 63kW (75/85bhp) engines to cope with, but with good handling, were nonetheless quick to drive from A to B.
Fiat worked hard to produce a new coupe for the ’90s. Known variously as the Coupe Fiat (officially) or Fiat Coupe, design work began in 1989, and it was introduced in 1993/4 with a four cylinder 1.8 or 2.0-litre 16 valve engine, available with or without turbocharger, putting power through a five-speed gearbox to the front wheels. Fiat had the handling very well sorted, and the stylish body, featuring slanting ‘cuts’ by the wheels, was designed by Chris Bangle from the Centro Fiat Stile, with the interior worked up by Pininfarina. In 1996, a five cylinder 20-valve engine was introduced, and the turbo version of the new coupe was at that time one of the fastest fwd cars around, able to do 0-100kph in just over six seconds. In 1999 a Turbo Plus version was introduced, along with a six-speed gearbox. Production ceased in 2000, with over 72,000 produced. Limited numbers only of the 2.0-litre 16V and 20V models, with or without turbo, were brought into NZ, starting from August 1995 through to 1999. They were priced at around $60-70,000 dependent on the model. The main enemy alas has been rust, throughout the body, and these neat little coupes are now a rare sight. Mechanical checks must include a good check of the cooling system: in good shape, it will do the job, but neglected systems are marginal in warm weather conditions, and overheating will cause head gasket and cylinder head problems. These little engines are designed to rev freely, but will probably start showing wear and tear every 100,000km, with increased oil consumption a good clue. They are not the quietest or most oil-tight of engines either! Rebuilds are not too difficult a task, with parts available at a price. Transmissions last fairly well, though they can get noisy, and second gear synchro will eventually wear out. Rust the big bugbear again. There are still a few nice ones around though. Mechanically these are once again not too bad, with the engines fairly reliable and parts still available for service and (probably expensive) rebuild. All engines seem to be fairly durable, and likewise the transmissions, though the synchro will wear with age. Once again there is the caveat about the cooling system — it needs to be kept in good shape, and oil leaks around the cylinder head are not a good sign. Though some owners have had decent runs, reliability surveys generally don’t paint this car in a good light, but closer reading points more to lots of smaller stuff going wrong, rather than major mechanical issues, though there are some alarming stories of gearbox problems. Regular servicing is essential. The timing belt and tensioner job is expensive on these cars — especially the five cylinder — but must not be neglected. Plastic fittings of all sorts, both underbonnet and in the body, do not seem to last the distance. The coupe is both low at the front, and does not have a good turning circle, so scuffs on the front wings and underside are often found, plus kerbing damage on the wheels.